Many of you who follow me have seen a number of photos from the Palouse showing the amazing rolling landscape of some of the most fertile farmland in the world. In the spring, this farmland is all green with the stalks of crops, mostly wheat. In late summer, the landscapes changes color to more of a golden color. The landscape is totally mesmerizing especially when the wind blows and the landscape looks like there are waves in them. I am sure that when America, the Beautiful was written, the line "For amber waves of grain" represented this effect of the wind. When Jeff Clow and I visited the Palouse a couple of years ago, the harvest was well underway. 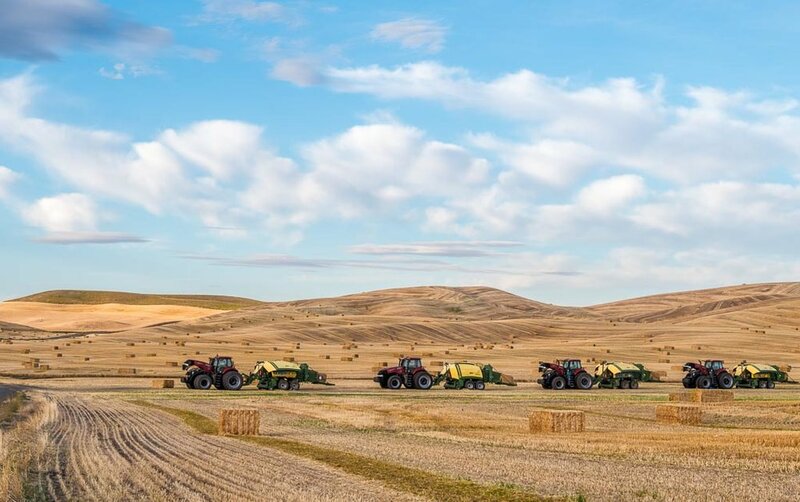 There were many scenes with the "amber waves of grain" to be seen but there were also many scenes like this one showing the line of large farm equipment after they had harvested the wheat into bales. This is a part of the annual ritual of farming that isn't frequently seen online and I decided to post this scene.